If you enjoy spy and mystery adventures, you’ll like the White Knights series by Julie Moffett, YA/NA Mystery and Mayhem Award-winning author and writer of the popular geeky Lexi Carmichael mystery series. Try out Julie’s fun, young adult series today! Happy Holidays, everyone! I’m so happy to be here. My name is Julie Moffett and I write the award-winning mystery series featuring geek girl extraordinaire, Lexi Carmichael. Geeks, Lies and Spies, oh, my! In my mystery series, you’ll meet Lexi and her nerd herd—a quirky gang of tech friends who save the day and solve the mystery by using their super-charged brains. There are currently 11 books in the series, with the latest one, NO STONE UNTURNED, scheduled to release on January 14th. It’s a question as old as time. Okay, maybe it’s not that old, but I’m occasionally asked what I’d like for Christmas as an author. People are usually surprised I hold down a full-time job in addition to writing. Here’s a big (#notsobig)secret — writing isn’t always a lucrative business. Most mid-list writers can best be described as struggling artists. I have several friends who are considering giving up writing altogether because of financial infeasibility. This doesn’t have to happen. There are ways you can help your favorite authors keep writing. To help you out, I’ve listed five big ones. 1.) Buy the Book. Sounds simple and it is. Each book you buy helps the author increase his/her sales record and be better positioned for future books. 2.) Buy the Book as a Gift. Books are the perfect gift. Besides, if you ask nicely, most authors will happily provide a bookmark or bookplate so you can give an autographed book. There are ways to sign e-books, too. Just ask. Plus, who DOESN’T want books for the holiday?!? 3.) Recommend the Book. Word of mouth is a great way to help your favorite authors get recognized by others. You can recommend it to your neighbors, friends, co-workers, book club and family. You can blog about it, mention it by name (providing links is even better!) on Facebook, Twitter, Instagram, Pinterest, or your favorite social media. You can recommend the book or author in a post, invite them to blog or come to your online party in whatever venue you choose. Word-of-mouth is golden. 4.) Review the Book. If you have a blog, a Facebook account, a Twitter handle, Goodreads account, or belong to LinkedIn, tell others what you like about the book in your own words. Write a review. It can be an entire blog post or it can be a few words. It doesn’t matter. Just get the word out. Share your thoughts about the books on your social media platform. If you liked the book, a few kind words can make a world of difference. Reviews are so important to authors because the more reviews we get, the more opportunities we are given in terms of promotion. So, even a short “I liked it!” or “Cool beans!” will be met with HUGE gratitude by your favorite author. 5.) Let the Author Know You Like the Books. Most authors have websites and social media platforms like Facebook, Instagram and Twitter. It isn’t that hard these days to track down your favorite author. Don’t assume they are inundated with constant praise and encouragement from the public at large. The truth is that most writers operate in a vacuum. Most of the time we’re convinced our stuff is crap. If you enjoyed a novel, PLEASE take a minute and let your favorite author know. It can be just a sentence or two letting them know how much you liked it. I can tell you from personal experience that one positive fan letter can energize me for a long time. That is, perhaps, the best gift you can give a writer. I’m giving away two e-books of WHITE KNIGHTS. All you need to do is let me know how YOU like to support your favorite author in the comments below. Preorder No Stone Unturned HERE. Get your copy of Knight Moves HERE. 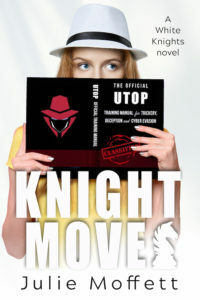 Julie Moffett is the bestselling author of the long-running Lexi Carmichael Mystery Series and the young adult White Knights spin-off series featuring really cool geek girls! She’s been publishing books for 25 years, but writing for a lot longer. She writes in the genres of mystery, young adult, historical romance and paranormal romance. 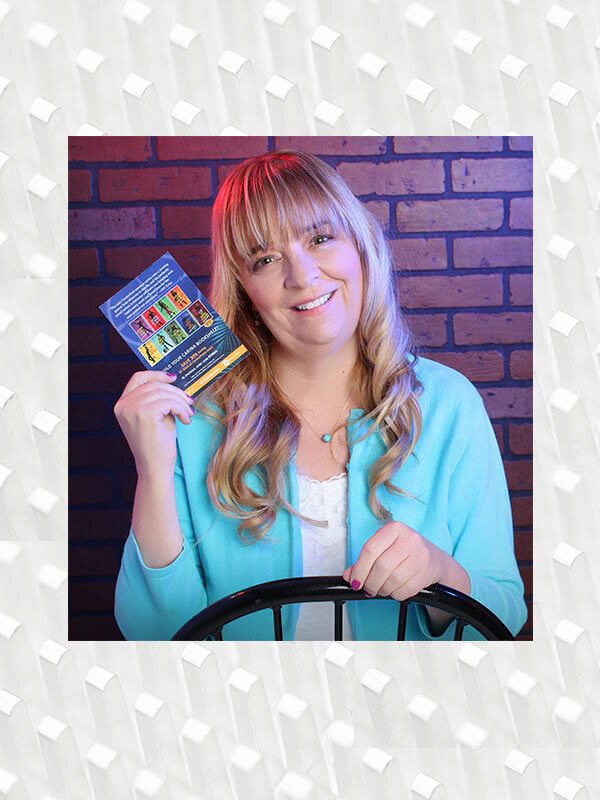 She has won numerous awards, including the Mystery & Mayhem Award for Best YA/New Adult Mystery, the HOLT Award for Best Novel with Romantic Elements, a HOLT Merit Award for Best Novel by a Virginia Author (twice! ), the Award of Excellence, a PRISM Award for Best Romantic Time-Travel AND Best of the Best Paranormal Books, and an EPIC Award for Best Action/Adventure Novel. She has also garnered additional nominations for the Bookseller’s Best Award, Daphne du Maurier Award, Dante Rossetti Award, and the Gayle Wilson Award of Excellence. Julie has a B.A. in Political Science and Russian Language from Colorado College, a M.A. in International Affairs from The George Washington University in Washington, D.C. and an M.Ed from Liberty University. She has worked as a proposal writer, journalist, teacher, librarian and researcher. Julie speaks Russian and Polish and has two incredibly sweet sons. I support my favorite author by following on all their social media accounts and website. I also obviously purchase their books, read them, and for most authors I pass the book on to other readers that I think would like the book. Have it so I am not entering the contest. I read it the first night, loved it, Loved it, LOVED IT! I support my favorite authors by reading their books within the first few days and reviewing it on at least major 3 sites but Goodreads and usually Bookbub. They may not be great reviews but they count. I tell my friends how much I enjoy the book and what I loved about it and share about it on Facebook . I hope some of that makes a difference because the authors I support are AWESOME and Julie Moffet is one of the tops on my list. I’m a book blogger, so I review books. I also buy A LOT of books from self-published authors. I buy books, I write reviews and I try to meet authors whenever there is a event near where I live so that I can thank them for their creative. I’ve actually met Julie and she is a lovely woman who appreciates her fans. I love her books!